On several levels, I find the recent article by John R. Donahue, SJ in Commonweal to be a brilliant and insightful example of liturgical and theological scholarship at its best. In fact, I have begun giving the article to students as a good example of academic methodology. Read the whole article right here. In "Cup or Chalice? The Large Implications of a Small Change," Fr. Donahue focuses on just one of the recent liturgical changes, and one that seems fairly innocuous at first. But small changes considered cumulatively can add up to something quite significant. Before turning to specific concerns, let's first consider some basic tenets of communications. Whether we refer to the vessel used by Jesus as a "cup" or a "chalice" may not seem like much at first, but as Fr. Donahue illustrates, it matters greatly. What some of those involved in these translations seem to have missed is something that every first year student of communications theory understands well. Let's consider some basics. We begin with an idea which we desire to communicate to another person. It's deep inside my head and heart, however, so I have to find a way to encode what I mean in a variety of ways. Perhaps I will choose words as these symbols; perhaps I will draw a picture or sing a song; perhaps I will simply do something that expresses the inner reality. Once the internal message is "encoded" we need to find the best medium by which to transmit that message. Perhaps I will write a book or compose a poem. And then comes the challenging part: I know what I want to say, and I've worked hard to find the best words and other symbols to assist in communicating that message; however, the recipient of my communication must be able to receive and "decode" those words and other symbols in a manner that comes close to replicating my original meaning. With any luck, that internal reality that was in me has now found resonance in the other person. In other words, it's not just important that I get the words right; the recipients need to be able to "get them right" as well, or any attempt at communication will be lost. How do we know whether this has happened? This takes place through the most important part of the communications loop: the feedback loop. This is how we know whether or not our message has been understand as we intended. How many times in life have we had to say, "Oh, that's not what I meant!" when someone responded to something we've said or written or done? After seven months of the "new" translation, what is being communicated via that "feedback loop"? Fr. Donahue mentions the stumbling over prayers (especially, I would note, the Collects) by presiders, the "resignation" of all to the various archaic English expressions which were supposed to evoke a sense of elevation, reverence and awe, according to the proponents of the translation. Instead, the language in many cases simply sounds and feels remote and artificial according to the many comments made by parishioners. Furthermore, and this is something not mentioned by Fr. Donahue, but something that I feel is quite significant: From what I have experienced over these months in assisting as deacon at many Masses presided over by many different priests has been a tendency to "re-write" (especially the Collects) the prayers, usually on the fly, in order to help them be more understandable in proclaimed form. While I applaud the pastoral sensitivity involved, I would simply point out that this opens the door to increasing adaptation of the very texts which its designers sought to avoid! More disturbing, of course, is the further "distancing" caused by many of the choices made in the new translation. By focusing exclusively on the Latin text, and despite the claims of proponents to the contrary, we have distanced our liturgical language from our more ancient scriptural and liturgical roots. "Faithfulness to the Latin" -- and even how well that claim stands up to scrutiny is a matter of debate in itself! -- has undercut the intentions of both Dei Verbum and Sacrosanctum Concilium by cutting us off not only from the more ancient terms found in Greek, Aramaic and Hebrew, but from the rich tapestry of meanings those ancient terms sought to convey. Vatican II wanted the sacraments to be characterized by a "noble simplicity", and in language accessible to all with ease. Turning to Fr. Donahue's specific question, I would only add that, in my opinion, the repeated use of "chalice" constitutes an anachronism. 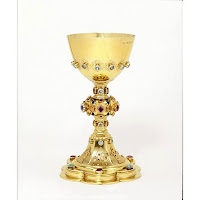 The term "chalice" in modern times has come to mean the kind of liturgical vessel familiar to many at Mass; we don't speak of wine "chalices" in our homes, or even in fancy restaurants. The term is almost exclusively used in reference to a church vessel. As Fr. Donahue points out, there was a Greek version of a more ornate liturgical vessel reflected by its own Greek word, but the fact is, such a Temple cup was NOT what Christ used, nor is that what is referred to throughout most of Judeo-Christian scriptures! What IS referred to is a cup, plain and simple. To retroject the word "chalice" into the liturgical language is, in short, anachronistic, misplaced, and misleading. Put simply, the focus of the translation seems to be on the first half of the communications loop: finding the right symbols and meanings to translate the Latin text, without paying any real significant attention to the second half of the loop: How will all of this be received, translated and interpreted by the people receiving the message? I find it interesting and amusing that even Hollywood understands all of this quite well, and perhaps the proponents of the change from "cup" to "chalice" might have benefited from re-watching that great theological epic, Indiana Jones and the Last Crusade (which, I might point out, was all about the quest for the Holy Grail: the CUP that Jesus used at the Last Supper). In the climactic scene the villain and the hero must choose which vessel was the one used by Christ. The villain chooses the most ornate "chalice" of all the vessels there, saying that this was truly worthy of "the King of Kings"; in doing so, in "choosing poorly" (as the ancient guardian proclaims), the villain is doomed. The hero, conversely, chooses the "cup" of a carpenter's son; he has "chosen wisely" and is able to find renewed life. As a deacon, linguist and theologian, I have found the journey of "reception" of the newest translation of the Roman Missal to be a mixed bag at best. These "little" examples ("cup" vs. "chalice", "many" vs "all", and of course who can forget "dewfall," "consubstantial" and "oblation"?) add up to an effective rejection of the positions taken by the world's Catholic bishops gathering in council at Vatican II: that the liturgy should be expressed in language easily understood, grounded in the most ancient Tradition of the church, and in ways that would ensure the "full, conscious and active participation" of all. I find that just the opposite is happening, and that many of our parishioners are finding that when coupled with so many other examples of ecclesial "distancing" from the real lives and problems of people, this becomes just one more reason to walk away from the institutional dimensions of the Church. The symbols chosen for us are not being interpreted and understood as intended, which means we must go back to the drawing board and try again. We must choose wisely. "Faithfulness to the Latin"? Why not faithfulness to the "Greek" if we are seeking biblical "faithfulness" or even faithfulness to "Aramaic"? The musings of a deacon whose primary (only) language is English, although the U.S. Government spent a good deal of money to teach him Spanish and Italian. Faithfulness to the Latin because the Latin is the language of the official texts of the liturgy, which are what need to be translated. These are not translations of the Bible, even if in some instances the original Latin contains bits that are translations from Sacred Scripture. There is no Greek or Aramaic of the prayers of the Latin Rite. What you write is fairly accurate (although there is at least a little Greek in the Latin Rite (The "Kyrie"), except it still misses the more fundamental point: the "Mass" was not always celebrated in Latin. The original languages of the Rite were many and varied, with the most common language being Greek. It was only as the Roman Empire was disintegrating, and the common language of the Empire -- Greek -- was disappearing. So, the "street language" of Latin began to be used. Interestingly, the reason was that Latin was NOT a sacred language known only by the learned, but just the opposite: Latin was the language that everyone knew; it was the everyday language of the people. Also, any translation from one language to another involves a new set of symbols, and there is always some measure of distortion in meaning; there is never a perfect one-for-one correspondence. So, when dealing with the Eucharist, why shouldn't we go back as far as possible to find our ritual language? Latin is fine, put it's not some kind of sacred language that possesses all Truth within it. I think you put your finger on it: Latin has become some kind of sacred language as if handed down on tablets, rather than a first amongst equals. I am still wanting someone to explain why, in the collects, God has become plural: now that really is troubling. Is the stated goal of ICEL -- to foster/create/mandate an very unique idiom of English to be the "official English" of the Universal Church ? Is the very theory of a "Universal Church English" even desirable much less possible ? Just as important, how much of the complaining about the ICEL text of the new Roman Missal is really a gut-level response to how "political correctness" is imbedded in the ICEL itself ? With all of the diverse cultural idiomatic backgrounds of the bishops on the ICEL, and with the whole idea of the "Ugly American" still haunting certain European and Asian thinking, creating a "Latinized" text was something the ICEL could come to consensus on -- even though I cannot believe any of them were enthusiastic about it. I have long come to be at peace with this ICEL translation, even though it violates every theory I value -- and all my lived experiences -- about how translation works and does not work. Ironically, it's this very debate over the message sent that lead me in college to what is now forbidden. I was the Liturgy coordinator for our Newman Center. Every Wednesday evening we had a very small group of students that came together for Mass. As I would lay out the hosts and wine for this Mass, I was the one that got to choose the cup/chalice used at the Mass. Our Newman Center had quite a collection donated over the years ranging from very ornate KC 4th Degree Chalices to a very simple walnut cup made out of the same tree that our Altar had been crafted from. On most nights, I opted for the cup made of wood. To me and, as I came to find out, the other students, this simple wooden cup was a closer symbol to Christ's than the others. The point about translating the Latin isn't that Latin is somehow a sacred language — although I'm sure you're both aware that, while allowing some use of the vernacular, Vatican II called for retention of Latin in the liturgy. The point is simply that the texts of the Missale Romanum are in Latin*. They — not the Greek, Hebrew, and Aramaic of the scriptures, or the Greek of reconstructed earlier ROman liturgies or of Eastern liturgies — these Latin texts are what need to be translated into the vernacular if you want to have the Latin rite liturgy in English. *Yes, yes, I know that Κυριε ελεησον is Greek, but why do people waste the time and effort to make that insignificant point which really has nothing to do with translating the Latin of the Missale Romanum? Interesting. I wonder if archeology would support your conclusion. Was it based on more than sentimentality? I'm aware of metal and ceramic drinking vessels from antiquity, but not wood. So if it were a choice between wood and metal as being what Jesus might have used, I'd think metal was more likely — although ceramic might have been even more likely. naturgesetz, the most likely candidate for the cup used by Jesus is preserved in Valencia. It's made of agate, which would not be permitted by the Vatican today. Apparently Jesus was not up on all the liturgical regulations. Why is it that proponents of a more obscure and encoded translation spent years pushing their agenda line by line, but now when anyone questions it they're "wasting time and effort"? He starts out by miscasting pretty much all of the words. "Potērion" does not mean "ordinary drinking cup in daily life." It is a more general term for any drinking vessel, not just ordinary ones. "Kylix" is the basis for the Latin "Cylix" from which come chalice, but it is more complex than that. The "kylix" was a low vessel with two handles. The "liturgy" it was associated with were the drinking parties dedicated to Bacchus. As such, most were decorated with often lascivious) scenes of Bacchus that would be slowly revealed as the wine was drunk. It should be quite understandable that the NT authors would not choose this word. And it is disingenuous of Mr. Donahue to characterize the Greek word as applying to all liturgical vessels. With three centuries and a culture difference between Jerome and the NT writers, it should be unremarkable that some of the cultural baggage of the Greek word had not made it over. "Cylix" may have a root in "Kylix," but they are not the same word. Jerome did not make his choice willy-nilly. We have to remember that he was deeply immersed in the Palestinian world, and he was cantankerous about his translation. He chose that word for a reason. If there is a translation "problem" it is not with the new Missal translation, it is with the Vulgate. Finally, we have to address the issue of the Last Supper itself. We often hear, "Oh Jesus was a simple and poor preacher, the vessels would have been simple and poor." But let's consider a couple of things here. When Jesus was crucified, he was wearing a seamless garment, and a seamless garment was expensive. When the disciples followed to the "place that had been prepared," they were led to an upper room. A second story was an expensive, luxurious space in that time and place. The place that had been prepared had been a place for a wealthy Jew to celebrate Passover. The vessels of the Last Supper were not the vessels of a poor carpenter, they were the vessels of the wealthy. And we also have to remember what the Passover seder was and is. It is a ritual feast. It is liturgical. The best vessels are used, not the everyday vessels. If Mr. Donahue had looked just a little deeper into the issue, he would have found all of this; he would have seen that the conclusions that he draws just don't hold up very well. This is not good scholarship. It is not brilliant. This is agenda seeking some tidbits from a lexicon or dictionary to form a polemic.